Matthew's Gospel tells the story of Jesus the Messiah whose signal genealogy and miraculous birth are the sign and promise that "God is with us" (1:23). Jesus the Messiah proclaims God's continuing righteous reign in his words of blessing and deeds of healing. Jesus calls his followers to experience God's mercy anew, constitutes them as a new community of faith, and then, as crucified and resurrected Messiah, claims all power and authority as he commissions these disciples for mission with the promise that he will be with them until the end of the age (28:18-20). The Gospel of Mark is considered the earliest written of the four Gospels. The Gospel of Mark is about the good news (gospel) of Jesus Christ, who is identified as one from Nazareth at his baptism, recognized as God's Son by fearful demonic spirits, and proclaimed as the resurrected Lord by a young man in a white robe. In Jesus of Nazareth, crucified and risen, the reign and rule of God's kingdom has come among us. Beginning with angels announcing the conceptions of John the Baptist and Jesus Christ, and concluding with the resurrected Jesus being carried up into heaven, the Gospel according to Luke offers an account of the life, death, and resurrection of Jesus of Nazareth. Luke presents the story of Jesus as the fulfillment of God's promises. Jesus is Christ, the Lord, the redeemer sent by God to the people of Israel, the one who declares God's salvation to all people. Jesus proclaims God's reign, heals the sick, raises the dead, casts out oppressive spirits, restores people to full participation in society, and teaches his followers through vivid parables. Join us for three presentations that will provide a guided tour of the Gospel and what it means for our lives today. The shortest of the four gospels, Mark is the earliest account of Jesus' life. With no mention of Jesus' infancy, Mark begins with Jesus' baptism in the Jordan by John and climaxes with the announcement of his resurrection to the women at the tomb. Mark asks everyone to answer Jesus' question, "Who do you say that I am?" and challenges believers in every generation to accept the harsh reality of the cross. Mark, along with Matthew and Luke, is one of the synoptic gospels. It is the primary gospel of year "B" in the Catholic Church's liturgical cycle. You can obtain copies of the book when you register for the study group. With a scholar's mind and a pastor's heart, Tom Wright walks you through Luke in this guide designed especially with everyday readers in mind. Perfect for group use or daily personal reflection, this study uses the popular inductive method combined with Wright's thoughtful insights to bring contemporary application of Scripture to life. This guide by Tom Wright can be used on its own or alongside his New Testament for Everyone commentary on Luke. It is designed to help you understand Scripture in fresh ways under the guidance of one of the world's leading New Testament scholars. Thoughtful questions, prayer suggestions, and useful background and cultural information all guide you or a group more deeply into God's Word. The Gospel of Matthew contains some of the most famous passages that both Christians and non-Christians are familiar with. However, Matthew also presents itself paradoxically as preaching a Torah observant Christianity and a Christian mission that seeks to reach gentiles. The figure of Jesus in Matthew is that of a teacher, the founder of the Church, and the model for the apostles and Matthew's own community. Matthew seems to be writing for a church community that needs encouragement to have faith in a time of trouble. Go to Open Yale Courses to watch the Video Presentation. The Gospels of the New Testament are not biographies, and, in this class, they are read through a historical critical lens. This means that the events they narrate are not taken at face value as historical. The Gospel of Mark illustrates how the gospel writer skillfully crafts a narrative in order to deliver a message. It is a message that emphasizes a suffering messiah, and the necessity of suffering before glory. The gospel's apocalyptic passages predict troubles for the Jewish temple and incorporate this prediction with its understanding of the future coming of the Son of Man. Take your own self-paced, online journey through the Gospels with the help of the Enter the Bible website. Read the Gospel and learn about the people, places, culture, and theological themes in the Gospels. Watch the videos to explore more deeply the portraits of Jesus in the Gospels and his teachings. The YouVersion Bible App is free for your phone, tablet, or computer. It has hundreds of Bible versions in hundreds of languages. 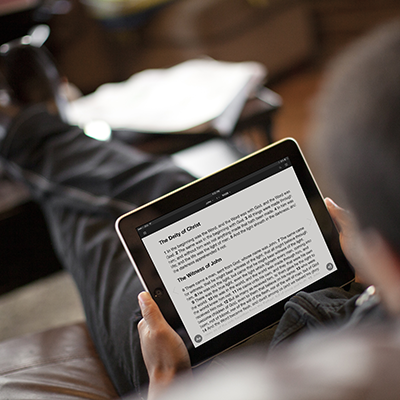 The team at YouVersion creates reading plans for users. The Gospels reading plan will help you read through all four Gospels in thirty days. Get firm grasp of Jesus' life and ministry in a short span of time. Download the App and then search for the Gospels Reading plan. Devotions and readings suggested for daily meditation and prayerLectionary readings from the Presbyterian Church USA. Lectionary readings for every day of the year are available online - in print, audio, and video. People can also subscribe to the Daily Readings RSS Feed, go to the iTunes store and type in "Daily readings from the New American Bible" in the search window, and listen to the Daily Readings on their computer from the RSS feed where you can play the audio using your mp3 player. The Daily Word of Life's Home Bible Study, created by author Kay Murdy, is intended to give beginners a firm foundation in the study of Scripture and assist more experienced readers of the Bible, covering an overview of the Old Testament, New Testament, and the Synpotic Gospels. The Essential 100 Challenge™ (The E100) is an effective Bible reading program built around 100 carefully selected short Bible passages — 50 from the Old Testament and 50 from the New Testament. It enables people in your church to get the big picture of God's Word and in the process develop a daily Bible reading habit. The E100 is a carefully selected list of short Bible passages - usually one to two chapters in length and can easily be read in 10 minutes or less. The E100 Challenge takes a reader through all of the major types of biblical writing including Historical books, Poetry and Wisdom Literature, the Prophets, the Gospels, Acts, the Epistles and Revelation. Invitation to the Word is just that — an invitation to Jesus Christ, the living Word, through Scripture. It is an invitation for congregations, communities, small groups and individuals to be immersed in the Spirit through the Word. It is an invitation to five simple practices that can form us into Scripture-shaped communities, congregations and individuals. It is an invitation to read, pray, study, remember and live Scripture. Free, downloadable resources online. Whether it's a daily or weekly e-mail Bible study, audio, print, or a text message, you can explore the eternal truths of the Bible in the way that best fits your life. With a variety of topics topics to choose from, each journey contains verses and Bible studies each day of your journey—making God's Word relevant and personal to you. Our Daily Bread is daily devotional that help readers spend time each day in God’s Word. It is published and distributed worldwide in more than 40 languages. Our Daily Bread radio is a daily audio program that features insights from the pages of Our Daily Bread. Each daily thought is designed to draw the listener into a closer relationship with Jesus Christ and to evoke responses of worship, love, trust and obedience. Our Daily Bread is distributed via print, radio, podcast on iTunes, email, rss, and mobile (in the Apps Store at iTunes). For social networking users, find Our Daily Bread on Twitter andFacebook. What Does the Bible Say to You? presents Bible verses by theme around everyday life issues: emotions and feelings, life situations, life transitions, and family and friends.